Keeper league strategy is a popular topic around this time of year in fantasy football circles. Which player(s) you should keep depends on your league bylaws. If you don’t lose any round for your keeper selections, then your task is somewhat easy. Simply keep the highest-ranked players in overall rankings and call it a day. However, if your keeper selections come with a loss of round, the choice isn’t nearly as easy. How do we determine keeper value for players with different round penalties? There’s very little on the subject on the interwebs, but we have you covered here at PFF. If you want to take the guess work out of picking your keepers, I suggest using the PFF Keeper Value Chart. Here’s an example of how this chart can help you make your fantasy life a whole lot easier in your keeper leagues. Let’s say you have to keep one player and you lose the round he was drafted in. You’re in a PPR league picking third in the first round in a 12-team league. Here are your two keeper choices: Todd Gurley in the second round or Kareem Hunt in the fifth round. Both players are likely to go in the first round if there were no keepers. But since Hunt can be kept at a later round, he’s the better value, right? Believe it or not, that isn’t correct. I know. You don’t believe me. But according to the keeper value chart you actually should keep Gurley. Let me explain. All picks are not created equally when it comes to value. 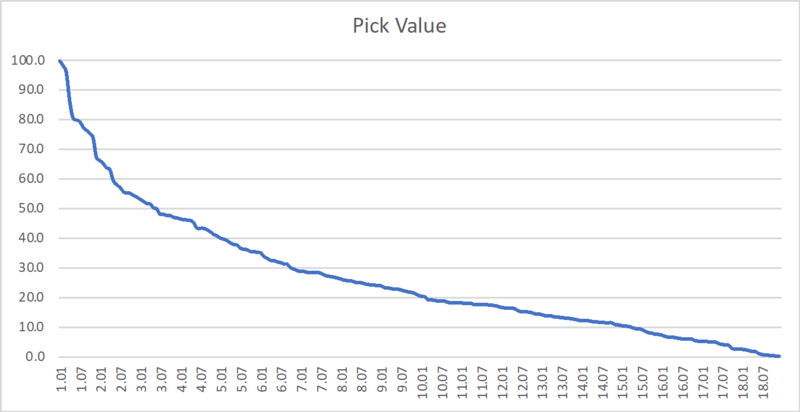 Earlier picks are of course more valuable than later picks, but the value doesn’t drop off in equal increments from pick to pick. That value dropoff is much steeper in earlier picks and becomes much more gradual later in the draft. To establish the pick values in the graph above and in the keeper value chart, I calculated the value over replacement for each player in a given scoring system and then converted this over to a 0-100 scale. It’s actually a similar process to how one might go about calculating auction values. The end result revealed a quantified value for each pick. The next step in the process is to establish a value for each player. This is the exact same process as calculating the pick value. Simply calculate the value over replacement and convert to 0-100. Note that depending on where your replacement player line falls, you’re likely to get negative numbers for some of your rounds and players. That’s fine, because all numbers end up as positive values when you covert over to a 0-100 scale. Now, let’s get back to the example. Todd Gurley is a better value as a keeper even though you lose a second-round pick. Let’s refer to the chart to see why. Since Johnson comes in as our No. 2 player in PPR scoring based on the PFF projections, his player value is 95.6. The value of pick 2.10 in a PPR league is 60.3. To get Gurley’s keeper value in this scenario, subtract his pick value from his player value. That gives us a keeper value of 35.3. We’ll repeat the process now for Hunt. His player value is 75.4. Since you have pick three in the first round, you’ll also have the third pick in the fifth round of a snake draft. The value of pick 5.03 in a half-point PPR league is 41.2. Subtracting the pick value from the player value gives Hunt a keeper value of 33.3. So while it’s close, Gurley still offers the better value and should be your choice in this scenario. Remember, you always want to keep the player with the highest keeper value. When it comes time to pick your keepers, the keeper value chart eliminates the guess work and gives you the best bang for your buck with every one of your keeper selections.